Catholic teenagers are at an age where they are starting to consider seriously the path they will follow as they become adults. The Catholic faith encourages them to enter into this consideration through prayer, seeking to know the vocation to which God is calling them. The 23,000 teens who participated in the National Catholic Youth Conference held on Nov. 19-21 at the Indiana Convention Center and Lucas Oil Stadium, both in Indianapolis, had many opportunities to have the seeds of vocations planted in their hearts. Hundreds of diocesan priests, deacons and members of scores of religious orders took part in the conference. Sister Eliana’s life and ministry as a religious represents the diversity of vocations in the Church, and the twisting path that God can lead people on in their calling. She was born in Poland and served as a missionary in Africa before ministering to Hispanic Catholics in Chicago. Anna Schneider and Kauleen Dee came to NCYC from the Covington, Ky., Diocese. They appreciated the variety of vocations on display. Kauleen, 17, said attending the conference opened her eyes to many religious communities that do not minister in her diocese. Sister Krista von Barstel, a member of the Sisters of St. Mary of Oregon, came to NCYC from across the country. But she knows just attending the conference was a big part of planting the seeds of vocations. In addition to meeting priests, deacons and religious in various settings at NCYC, youths also had the chance to pray about their vocation during liturgies and in a eucharistic adoration chapel at the conference. There was a quiet room with comfortable chairs called “Inspiration Nook” where youths could have more personal conversations with attendees representing various vocations. The last afternoon of the conference featured a series of breakout sessions to help youths enter into vocational discernment. 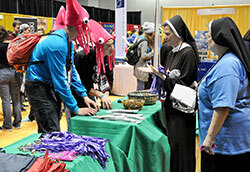 Redemptorist Father Lamar Partin, a vocations director for the order’s Denver Province, manned a booth in the conference’s thematic park, where several religious orders also had booths and interacted with youths. Dominican Father Raymond-Marie Bryce, associate pastor of the St. Paul Catholic Center in Bloomington, walked the halls of the Indiana Convention Center in his order’s white habit. He soon discovered that it was a “fantastic target” for youths to clip on clothespins that had their names and hometowns written on them—a favorite tradeable at the conference. “About every 10 minutes, I have to look to check myself to see if they’ve tagged me,” said Father Raymond-Marie with a laugh.